214 people died in a motor vehicle accident in New York City in 2017 compared to 231 in 2016. This is the lowest number of traffic fatalities ever recorded in one year since record keeping started in 1910. Among the 214 fatalities, 101 of them were pedestrians. The number of pedestrians killed in NYC crashes decreased by 32% between 2017 and 2016. There were 148 in 2016. Also in 2017 among the pedestrian fatalities there was only one child compared to an average of 7 for the previous 5 years. Among the five boroughs, Brooklyn was the only borough where deadly crashes increased last year. Traffic fatalities declined by 9% from 65 in 2016 to 59 in 2017 in Queens. Queens Boulevard which in the past was nicknamed the Boulevard of Death was progressively revamped and made safer over the last 3 years. Last year the DOT completed the third phase of street redesign of the Boulevard in Rego Park and Forest Hills. The boulevard hasn’t seen a fatality since 2014. While nationally traffic fatalities have been increasing by more than 13% between 2013 and 2016 according to the National Highway Traffic Safety Administration (NHTSA), the Vision Zero program developed by the de Blasio administration has led to a decline of 28% traffic fatalities in the city since 2013. 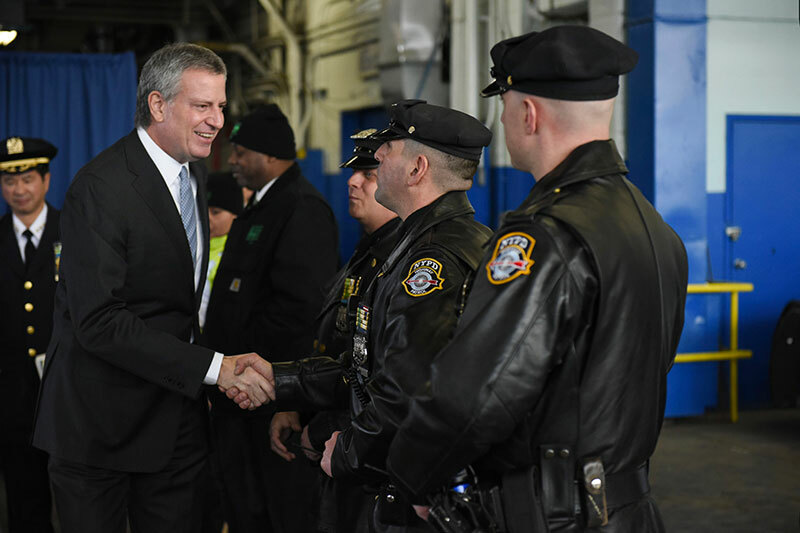 A reduction of the city speed limit to 25 mph, the re-engineering of more than 350 dangerous streets or intersections (including 114 in 2017) and the installation of speed cameras have been among the many initiatives deployed by the city to curb traffic fatalities. Traffic enforcement is also used heavily by Vision Zero to make drivers more responsible. Last year 50,000 drivers received a ticket for failing to yield to pedestrians or cyclists and 150,000 for speeding. An additional 1.2 million drivers received a notice of liability after being caught speeding by an automated camera. In 2017, the city also focused on better protecting pedestrians from turning vehicles especially those making a left turn. The Department of Transportation installed 832 Leading Pedestrians Intervals (LPI). LPIs give pedestrians a “headstart” in crosswalks and protect them from turning drivers. LPIs have proven very useful for senior pedestrians. 53 locations also received” Turning Safety Signal Treatments” which include split phases providing pedestrians, cyclists and drivers sufficient dedicated time to cross the intersection safely. The Dusk and Darkness campaign was deployed for the second consecutive year in October to prevent the increased number of pedestrians struck by cars after sunset during the winter months. Last year safety requirements were also upgraded for all city vehicles. New vehicles will use automatic breaking and city trucks will be equipped with side guards. The Taxi and Limousine Commission also developed a program to honor exemplary drivers and created new rules to prevent drivers fatigue.